This article aims to be a tour of France from 10,000 feet in the sky. An overview to guide you to the parts of the site (and of France) that are of most interest to you. France is one of the largest countries in Europe. It is bordered by six countries : Belgium, Luxembourg and Germany to the north-east, Switzerland and Italy across the Alps to the south-east and Spain across the Pyrenees to the south-west. The UK is across the English Channel (La Manche). France is regarded by many people as the geographical gateway to Europe. It has several large international airports, two of which are in the capital, Paris and many of which are served by budget airlines. Ferry terminals are located along the north, west and Mediterranean coasts. Visitors from the UK also have the option of taking the Channel Tunnel rail link. Once in France, the motorway network and French rail service are known to be extremely efficient with the high-speed, long distance TGV train service the envy of other nations. France is the world's most popular tourist destination and it doesn't take long to work out why. The country has an extremely diverse physical landscape and an equally diverse climate to match. This makes it the ideal venue for a huge range of sporting and other outdoor activities. For example, France has a huge range of golf courses. However, France also caters on a grand scale for those who prefer a more sedate pace of life. There are numerous museums and art galleries in France reflecting the fact that the French are fiercely and deservedly proud of their country's rich cultural, educational and political heritage. France has had a turbulent history characterised by successive revolutions but at every stage it has been at the forefront of European development. The notion of France as a leader finds its legacy in the country's pivotal role in the construction of the European Union as we know it today. The French people - and particularly the older generations - tend to be extremely courteous and formal, a national trait that is often ungenerously dismissed as arrogance by other nations. The French are also renowned for being 'chic', that is, for taking great pride in their personal appearance and in particular, their clothes. This is symptomatic of the importance placed on presentation in general in France. The French simply don't do scruffy. Shops, homes and public gardens are all immaculately kept and display immense attention to detail. France is known throughout the world for its cuisine and wine. The French love their food. Whenever possible meals are long, sociable family occasions which sometimes span several hours in the middle of the day. French meals usually involve three or four courses including cheese before the dessert and are accompanied by wine and freshly baked breads. A typical main dish might be Coq au vin (chicken in a red wine sauce), Coquilles Saint-Jacques (sea scallops cooked in butter) or Noisettes d'Agneau (sautéed lamb cutlets with mushrooms). However, French food varies enormously between regions with regional specialities and distinctive regional variations on classic French dishes. France is divided into 22 official 'régions' each of which is subdivided into several administrative 'départements'. Many of the regions have very clearly defined and distinct regional identities. This is in part due to the enormous geographical and climatic differences between the regions which force the inhabitants of the various regions to lead very different ways of life. Brittany (Bretagne), in the far north-west corner of France has one of the most distinctive regional identities. The region has a jagged coastline of wide bays interspersed with towering granite cliffs. The people of Brittany consider themselves as being slightly separate from the rest of France and the regional dialect, Breton, is still fairly commonly heard. Further east along the northern coast, Lower-Normandy (Basse-Normandie) and Upper-Normandy (Haute-Normandie) are renowned for their wide sandy beaches which were the site of the D-Day Landings of 1944. The region is also home to Bayeux where the famous tapestry of the same name telling the story of William the Conqueror's invasion of England is displayed. Both Normandy and Brittany are home to some beautiful, unspoilt stretches of countryside but these regions' have a varied climate with rain and cool winds in the winter months. Nevertheless, these regions are popular with British holidaymakers and property prices here have increased rapidly in recent years. For the best bargains head to the Finistère department where you can still get excellent value for money. Across the southern border of Brittany and Lower Normandy, you will find Pays-de la Loire. This region is home to spectacular châteaux and lush scenery. The region's Atlantic coast offers plenty of sandy beaches which stretch all the way down into Poitou-Charentes and Aquitaine. All three regions have hundreds of miles of navigable waterways and enjoy a temperate climate with warm summers and mild winters. Bordeaux is home to some beautiful 18th century architecture and the surrounding vineyards are also well worth a visit as this is one of France's most prolific wine-growing areas. The man-made forest of Les Landes is another asset of France's relatively undiscovered south-western corner. As a general rule, the closer you get to the southern French coast, the hotter and the more expensive it becomes. The south of France is generally extremely busy, particularly during the summer months. Many Parisians have second homes in Languedoc-Roussillon and Provence-Alpes-Côte d'Azur and spend much of August here. They are joined by tourists from France's neighbouring countries who come to take advantage of the sunshine and dazzling scenery. In the height of summer, yachts line the marinas of the Côte d'Azur whilst inland, lavender fields shimmer in the luminous sunlight that inspired such well-known artists as Van Gogh. Rhône-Alpes to the north of the Mediterranean coastal resorts is, as its name suggests, home to the French owned part of the Alps mountain range. The French Alps are buzzing with activity all year round and are home to some of the most popular year-round resorts in the world. Nevertheless, the area is still most highly acclaimed for its skiing and ski chalets are highly sought-after here. For example, the resorts of Chamonix and Courchevel attract skiers from across the world. However, the Alps are by no means the only mountains where it is possible to ski in France. The Pyrenees in the south-west offers some brilliant skiing and is especially recommended for beginners. Other options include the Jura mountains in Franche-Comte, the Vosges mountains in southern Lorraine and the Massif-Central in Auvergne. Auvergne is one of the least densely populated of France's regions. Limousin, Burgundy (Bourgogne), The Central Loire Valley (Centre Val de Loire) and Auvergne are all located in central France and do not have any coastal or national borders. These largely agricultural regions have suffered from rural depopulation recently. Fortunately, they are growing in popularity with foreign buyers who are attracted by the tranquil setting, slower pace of life and very reasonable property prices! The large number of lakes in Limousin and Auvergne is also attracting fishermen to these regions. Burgundy is a food and wine-lover's paradise. The wholesome, earthy flavours of the regional cuisine are irresistible. To the east of Burgundy lie the regions which form France's border with Switzerland, Germany, Luxembourg and Belgium. Franche-Comté is characterised by its landscape of woods and rivers. This is the perfect destination for ay lover of outdoor pursuits. Alsace and Lorraine have been fought over by France and Germany for centuries. A Germanic influence is evident in the regional accents and dialects, the strongly flavoured local cuisine and the architecture. However, the peaceful atmosphere of the fortified towns and rolling vineyards bears little resemblance to that of its turbulent past. Champagne-Ardenne is a region of contrasts. Whilst the department of Ardennes is hilly and densely packed with forests, the south of the region is full of water meadows and undulating plains. It is here, of course that the drink champagne comes from and where the stunning Reims cathedral is found. These regions experience cold winters and are generally very affluent due to the access they provide to the rest of mainland Europe. The most northerly region of France, Nord-Pas-de-Calais is home to the Channel ports of Dunkerque, Calais and Boulogne. It is also heavily influenced by its proximity to Belgium. The Flemish influence is reflected in both the physical landscape - windmills and canals cover flat seemingly never-ending expanses of land - and the local cuisine, architecture and beer festivals. This is, of course, also the site of the poppy-covered First World War battlefields, which act as such a moving and timeless legacy to the horrors that took place here. Closer to Paris, in Picardy (Picardie), there are numerous stately châteaux and splendid Gothic cathedrals. In this northern part of France the climate is not unlike that in the UK and since Paris is easily accessible, property prices come at a premium. No guide to France could possibly be complete without reference to the French capital. Paris is arguably one of the world's most majestic capital cities. It counts The Louvre and the Eiffel Tower amongst its many sites, the majority of which are within walking distance of the river Seine. Paris and the surrounding Île-de-France region are expensive but the wealth of architectural and cultural attractions it has to offer goes some way to justifying the high prices. France truly is a country with something for everyone. 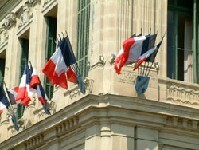 The geographic, climatic and cultural diversity ensure that France remains one of the world's top holiday destinations. With mountain peaks, glistening lakes, fertile plains, dense forests, sandy beaches and rocky coves counting amongst the countries many natural features, France really does have it all. Whilst the Alpine region is blessed with ample snow in winter to satisfy the best of skiers, sun-seekers relish the long hot sunny summer days that are enjoyed along the Mediterranean coast. French lifestyles vary enormously throughout France according to the physical landscape, neighbouring foreign influences and the prevailing weather conditions. From the steady pace of life in France's rural heart to the upbeat tempo of Paris and the glamorous southern ports there is a way of life to suit all tastes. With food and wine that are widely acclaimed and justly celebrated, art and architecture that are both striking and provocative and excellent sports and recreational facilities, this is a country just waiting to be explored. If you are considering a move to France or simply buying a holiday home here, the other great news is that there are plenty of cheap properties available and numerous plots of land for sale on which you could build your dream French home. I did have a property in Spain which I sold a couple of years ago. From my experience of the buying process and subsequent running of said property, one thing I did learn was that it is the information or legalities of buying in another country that you are not aware of, that can trip you up. For instance, I am aware that in France, inheritance rules which I must take into consideration, are completely different from that of the UK. Is there a complete package which I can read that includes all the buying details, rules, fees etc. plus any other info which would include making a will after purchase etc. Looking at lake properties I am also aware that certain licences need to be in place before a lake can be used as a business for paying customers. Whilst in Spain I bought a car. The dealer never told me that there IS car tax in Spain and the first I found out about it was when I got a letter left in my mail box for months that I had not paid it so they would add 10% for every month that it was not paid. You probably by now get my point, these sorts of issues were what frustrated me the most and in the end, due to the ever increasing costs that the Spanish decided to load onto non-residents due to the country's serious lack of cash, made up my mind for me to sell up. I am not saying this is the case in France as it is obviously a totally different country. But if there is a package that should be read I would be interested in reading it.